Present state: The station building has been demolished and a new house stands on the site. The track bed an be followed to the west of the station for a short distance with some upright JER rails forming a fence between the track and the coast road. These are embossed with the maker's name which is difficult to read and a date, 187?. Notes: Pontac station opened with the first section of the line on 7th August 1873 and was one of only two stations to have a passing loop and a second platform. (The other was Grouville). Generally the down platform was used for trains in both directions. The up platform was only used in busy periods when there was more than one train on the line. Both platforms were 225' in length with the main station building on the down platform. This was similar to other stations on the line comprising a single storey stone-built booking office and waiting rooms and staff room with a two-story stationmaster's house alongside. The up platform was only provided with a waiting shelter. 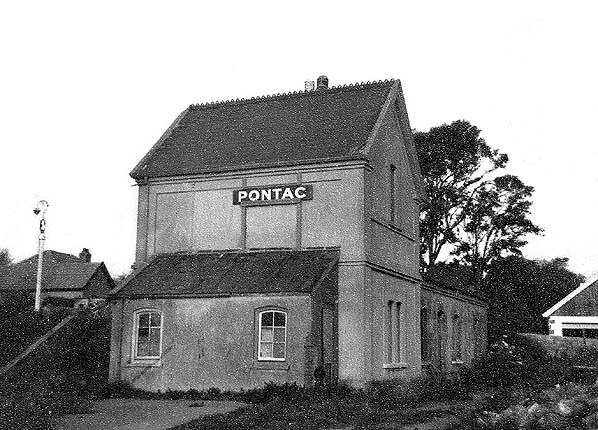 In order to attract freight traffic to the line Pontac was one of four stations where building materials could be delivered for people who were planning to build a house close to the railway. After closure of the line one of the brake composite coaches was sold at auction to Mr. McQueen the former stationmaster at Pontac. 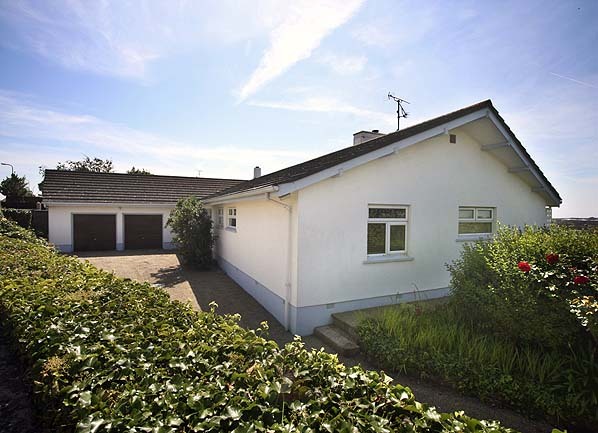 The body was removed and relocated to a field near the station where it was used as a family home where a building was constructed round it to increase its size. The coach was still in the field in the 1970s when the building was demolished, the coach was sold to the Jersey Motor Museum at St. Peter's for £50 and it has now been restored.. Following the early success of the St Helier to St Aubin line (Jersey Railways & Tramways Co. Ltd or JR & T) which opened on 25th October 1870, a new route was soon being planned running east from St Helier, the Jersey capital. On 18th January 1871 a Bill was put before the States (Jersey) parliament for a line to be known as the Jersey Eastern Railway, running from St Helier to Gorey on the east coast. The line was approved on 16 March 1871 and confirmed by Order in Council on 19 March 1872. On 15 May 1871 the committee appointed by the States met to consider objections by landowners; the majority were satisfied if they received fair compensation. Fencing along the route began on 1st May 1872, but within two weeks there was an industrial dispute with navvies demanding a pay rise and a reduction in hours; the contractor, Daniel Baldwin from Weybridge in Surrey, was forced to agree to these demands to avoid harsh financial penalties if the line was delayed, but he made it clear that if there was any industrial action he would be forced to bring labour from England. The first turf was dug by Mrs Mourant, wife of Edward Mourant, the chairman of the Board of Directors, at a private ceremony on 17 September 1872. By this time preparations for the line were already progressing well with rails, sleepers, fishplates and spikes being placed along the route ready for the track to be laid. The standard gauge line between Snow Hill and Gorey was 5¾ miles in length and single track throughout, with two passing places. An engine shed was built at Green Street to the south of the Snow Hill together with a temporary station, as it was unlikely the terminus at Snow Hill would be ready for another year. In order to reach the centre of St Helier it was necessary to excavate a deep cutting through the Mont de la Ville, a craggy outcrop to the south of the town. This proved a hazardous undertaking with a number of serious accidents and at least one fatality during the excavation. There were further delays due to bad weather with work being suspended for several months. As a result, in March 1873 Mr Baldwin was given more time to complete the line, so it came as a surprise when, on 17th April, he laid off his workforce without notice as the line was nearing completion. who had taken over the building of the line after the departure of Daniel Baldwin. After a few minor changes were implemented the line was inspected by an engineer appointed by the States on 9th July 1873. 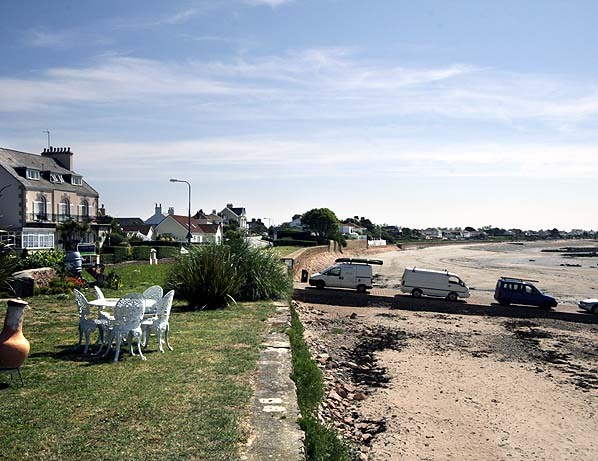 That afternoon a special train carried guests of the company to Grouville. Unfortunately, on its return to Green Street, the locomotive failed to stop at the correct place, was derailed, and collided with a stationary carriage when it ran onto rails that had been laid but not properly secured. 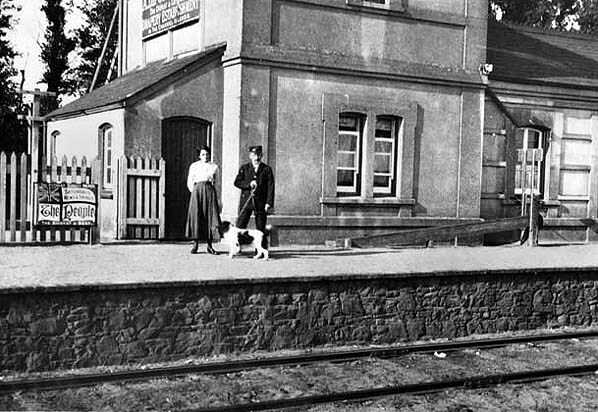 The first section of the line between Green Street and Grouville passed its inspection and opened on 6 August 1873, with a train of six carriages taking the States Members and their wives along the track to Grouville station in 15 minutes stopping at all intermediate stations: George Town, Samarès, Le Hocq, Pontac, La Rocque and Les Marais (later renamed Fauvic). At that time George Town and Les Marais were not quite finished, so they didn't open to the public until the following week. freight traffic failed to materialise apart from some fish traffic between La Rocque and Snow Hill from the 1880s until 1914 in an open wagon or an additional brake van attached to the back of a passenger train. Initially there were 28 trains running between Snow Hill and Gorey each day - which must have been difficult with only two locomotives to work the service - but this was later reduced to around 15, with some trains running non-stop between Snow Hill and Gorey on Sundays. In 1877 there were traffic receipts of £4,860 and, although no ordinary dividend was paid to investors during this period, debenture interest was paid in 1876/77 but not again until 1881 or later. Following the opening of the Carteret to Carentan Railway in France in 1881, a steam ferry service was established between Carteret and Gorey which brought an immediate influx of passengers, with through tickets to Paris and other principal stations in Northern France being available from all stations; on 1st February 1884 a dividend was declared for the first time. 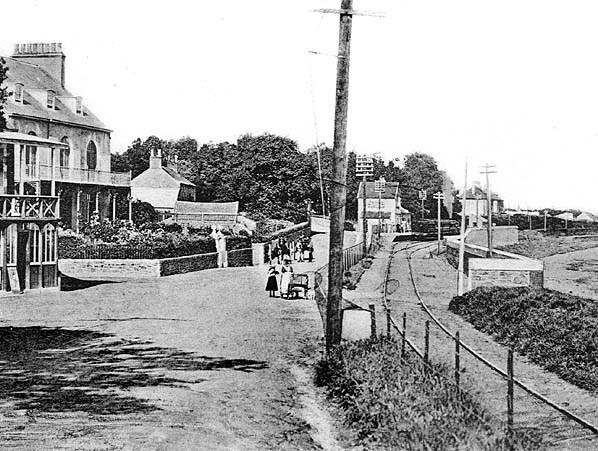 As Gorey was some distance from the ferry terminal the line was extended along the sea wall for half-a-mile to a new terminus at Gorey Pier. This opened on the 25th May 1891, bringing the final line length to 6⅜ miles. On 1st June 1896 two new stations were opened at St. Lukes and Grève D'Azette, replacing George Town which was closed. Into the 20th century, the line continued to be profitable with a regular dividend of 4% paid on ordinary shares. Traffic from the continent continued to flourish in the early years of the new century, and WW1 had little effect on the JER, although there was an increase in traffic from French reservists returning to France on the Gorey ferry whilst weekend and holiday excursion traffic dropped dramatically. With increased inflation after the war the company found it difficult to maintain standards of service, and a Bill was put before the States parliament to increase fares. This was approved, but with new bus services being established between St Helier and Gorey in the early 1920s passenger numbers were soon in decline. 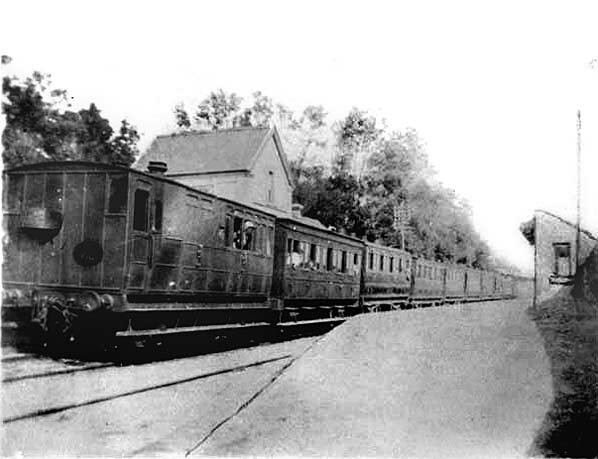 operating on the J R & T in 1923) probably hastened the eventual closure of the line. Railcars would only have delayed the inevitable. There was some improvement in passenger receipts in 1926, and there was a proposal to purchase a further five rail cars as well as the one that was already on order to replace the aging locomotives and carriages. Fierce competition from the Jersey Bus Company continued, and in May 1926 the JER started its own bus service between Snow Hill and Fauvic. This came too late to arrest the downturn. 1926 was a very bad year for the company which made a net loss of £853, although it still paid a dividend taking money from the reserve fund. A Sentinal steam railcar finally arrived from London on 2nd July 1927 and another followed shortly afterwards. Although these were quickly brought into service they arrived too late to save the line. On 7 August 1928 the JER proposed a merger with the Jersey Railway (JR & T); this was rejected by the JR & T board. The JER then approached a Mr Hunter who wanted to acquire a controlling interest and electrify the line; nothing came of this, and the board felt their only option was to close the line and withdraw the bus service from 21st June 1929. The following day the company was placed into voluntary liquidation. Demolition began in November 1929, with the locomotives and much of the track being shipped to Poland as scrap. Most of the land was sold to landowners whose properties bordered the track. on the track of the JER between Grouville and Pontac then followed the main road to Le Hocq to rejoin the JER to Grève D'Azette, where an engine shed was built. Following the liberation of Jersey on 9th May 1945 this track was quickly removed. Today the course of the JER is clearly visible for much of it length on maps and aerial photographs as many of the original boundaries have been retained, although it is harder to follow on the ground. Station buildings still survive at Gorey Village, Grouville, Fauvic, Le Hocq and Samarès, although the buildings at Gorey Village and Fauvic have been extended. Platforms can also be seen at Fauvic and Grève D'Azette with a short section at Le Hocq and Samarès. Sources: The Jersey Eastern Railway and the Occupation Lines by N R P Bonsor published by the Oakwood Press 1977 and 1986 ISBN 978-0853613459. The Jersey Eastern Railway by Peter Paye published by Oakwood Press 2007 ISBN 978-0853616641. Railways of the Channel Islands by C. Judge published by Oakwood Press 1992 ISBN 978-0853614340. Thanks also to Jersey resident Chris Totty for his invaluable information, photographs and for driving me round Jersey in June 2010 visiting 38 station sites in 1 day. A Gorey train waits at Pontac station. Pontac was one of only two stations on the line with a passing loop and second platform. Generally the down platform was used for trains in both directions. The up platform was only used in busy periods when there was more than one train on the line. Stationmaster McQueen and his wife stand in front of the station house. Looking east along the trackbed towards Pontac station in June 2010. The slipway in the foreground was built by the JER. The Pontac House Hotel is seen on the4 left and in the 1904 picture above.